For the last five years, I’ve tried to be a voice of reason in the wilderness of fishing promotions, hype, and advertising. On my website, this website, I get to say and do whatever I want at any point without major repercussion from anyone. Except maybe my wife. In Facebook land, however, it’s hard to break through the noise. Anytime a question comes up in a group about a product line that has prostaff folks or promotional minded folks, or heck, product owners, it makes it hard for everyone to filter out what they need and what they don’t. 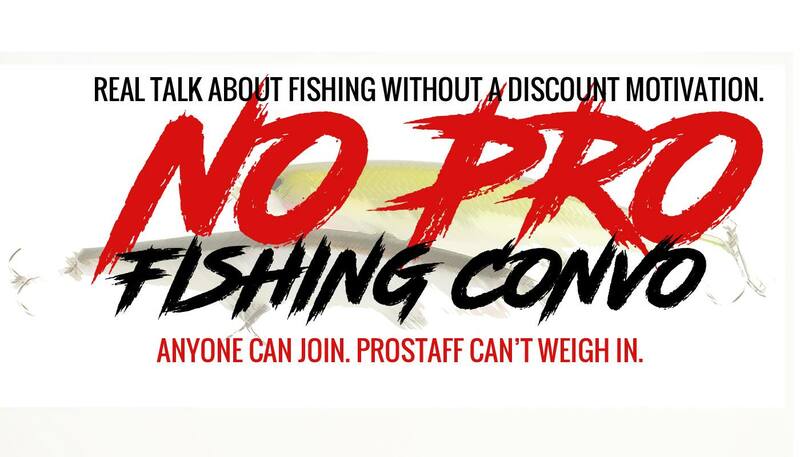 After talking with an outdoor industry friend of mine and kicking around some ideas, the NO PRO FISHING CONVO idea took shape. The Facebook group isn’t meant to be exclusionary, just filtered a bit. Anyone can join but if you are a prostaffer or promoter in a certain genre, you aren’t allowed to weigh in on the questions asked. You just have to sit back and watch the consumers discuss. This format serves a couple of purposes. First, it allows people with no financial motivation to discuss what others should spend their money on. More and more consumers are turning toward social media for answers and recommendations. Marketers know this and have “plants” everywhere to try to persuade you to spend your money with them. Secondly, this process reduces intentional or unintentional shaming based on budgets. It isn’t helpful when someone with a budget of $100 asks what baitcaster to buy and 30 people tell them to save more money and buy a Steez or they immediately say to buy 12 of the new KastSpecialChinaSpins that you can only get on Amazon. Which may or may not have paid for hundreds of positive reviews when getting started. It’s about straight talk, reducing fluff in the answers, and calling a spade a spade and a turd a turd. Not everyone is going to like the format and that’s cool. But if you want some help from people who are using the stuff you’re asking about or have had good and bad experiences, this could be about as close to the straight truth as you can get on the internet.